we have a workstation in the office that will not display the scalelist dialogue box so we can add additional scales. nor will it allow the command line to have more than one line. but the dialogue box is not there. we've tried typing the command, same issue. If the dialog is truly "off the screen", then you will not see the dialog that has "Move" on it, so I'm not sure what you mean when you say it's grayed out. Again, if the dialog is simply "off the screen", then ALT+Spacebar, then "M", then Arrow Key, then Mouse, has always worked for me. I just did it again right now. But how are you seeing that sub-dialog box, if the main dialog you are trying to get, is "off the screen" and not visible? Sounds like he's saying when using alt + space the menu pops somewhere up on the screen by itself? I can't replicate M being grayed out though and wherever I put the scale list on any of my three screens the sub-dialogue box goes with it. Screenshot of the issue may be helpful. well, not sure what i was doing wrong, but i got the scalelist dialogue back. 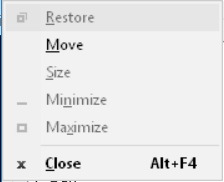 alt+spacebar will bring up the restore, move, size etc. dialogue. the way i got it back was to type scalelistedit at the command line, alt+spacebar brought up the move dialogue, but not grayed out this time, selected move and used the left arrow key to bring it back on screen, then clicked the mouse to the location i wanted it. Stupid Question (I think). ADEQUERY on commandline? editing a block attribute through commandline only.